Its getting chilly here in my neck of the woods and that means its time to put on the snow tires! If you have ever driven on snow tires before, you know that it can seemingly transform any car into a snowmobile. But whats really happening between the tread and the snow? With my summer tires on, just the slightest amount of snow on the road would pretty much leave me stuck; especially in my RWD vehicle. Even if the summer tire has tread blocks that look like it might do something in snow, somehow they never work. Enter the snow tire. If you have ever seen one, you would notice that they look a little different than a typical summer or all-season tire. 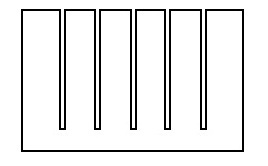 You will notice that they are deeply grooved and that the tread blocks have hundreds of fine cuts in them called Sipes. These sipes are where a most of the on-snow traction comes from but they are not the only thing. Sipes have very interesting properties and like everything else on a car, they have positives and negatives. A lot of all-season tires have sipes (though, not as much as a snow tire) on them for all-season capability and comfort. This is because they allow the tread blocks to deform; or as some people would say, to ‘Squirm’. This deformation allows the tire to soak up some road imperfections and thus make the tire feel soft and comfortable. But, the down side to siping is that overall grip on a dry surface is given up and so is some of the handling sharpness. But for the very same reason why dry grip is decreased with siping, is what gives them traction on snow and even mud. The reason for this is because the spied tread blocks deflect under the load of the car. Once they deflect, they created a jagged surface that increases the surface area of the tire and also allows them to bite into the snow. You can also see how dry traction would be lost because only the corners of the siped blocks come into contact with the road. 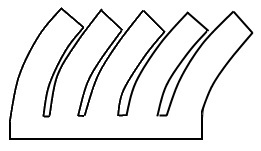 On a hard surface sipes decrease the contact area. If you have driven on snow tires you probably have also noticed that they have very soft sidewalls. The soft sidewalls also contribute to good performance in snow but negatively on a dry road. In the snow, it increases the contact patch longitudinally just like a drag slick. But on a dry road, the soft sidewalls can deflect when cornering causing very dull handling and even causing the sidewall of the tire to come into contact with the road surface. The final difference in a snow tire to any other tire is the rubber compound. Snow tires generally have a rubber compound that is designed to stay soft in a cold environment. Because of this, snow tires driven in warmer weather will wear out quickly because the rubber will be too soft at those temperatures. Snow tires can also have short strand glass fibers or carbon fibers molded into the rubber. These very small fibers stick out of the rubber just a little bit and are exposed as the tire wears. Because these fibers are very hard, they can dig into ice at a microscopic level providing traction. Not all snow tires have this feature. A common misconception of snow tires is that they should be skinny to get through the snow to the road surface. Although its good to have a skinny snow tire, this is not the reason why. If this were true, you would see patches of road left behind a car as it drove through snow. As we know, this is not the case. The sipes and design of the tire are actually gripping the snow as described above. So why is having a skinny tire good? Well, when driving on fresh snow, it takes a lot of energy for a wide tire to compact and get over all of that snow in front of it. A skinny tire can pass through snow a lot easier and save energy. 5 Comments to "How snow tires work"
Would you think its the sharp edge or the surface area on each side of the point increasing surface area of the tire by x2? Also if siping in affect makes the tire “softer” by increasing the play in the rubber? Its a combination of both. Snow tires from log ago use to have large knobby tread blocks that would essentially be just a few sharp blocks that would ‘dig’ through the snow. Though those tires were more effective than their non-snow counterparts of their generation, their performance is nothing like what we have today. So from that, we know that just having some blocks with square edges is only somewhat effective. But by increasing the area of those square edges with siping, we get a lot more surface that the snow can interlock with. If we just had a very large smooth surface area… well, we would have skis. Yes, siping allows for more deflection of each individual tread block making a tire feel softer. Wow, really nicely written article about snow tires, kind of makes me want to go buy a pair. Any idea how much they cost? How hard is it to change tires (seems like you need to do it twice year….). Also, any snow tires you’d recommend? For pricing, just go to discount tire or tirerack’s site. I have the Firestone winterforce tires, they are the cheapest and they seem to work very well. But, they do not have the fiberglass strands in the rubber which is a nice feature. You would need a second set of wheels for the tires, and it can be difficult if you have never changed a wheel before. Its even harder if you live in the city and don’t have a nice place to do it. Also, storage of a second set of wheels and tires can be a problem as they do take up quite a bit of space. If you can store them, and you have the ability to transport them, then you can just take them someplace and have them installed for you .